Home / Posts tagged "external doors"
Every homeowner and estate agent can tell you, a home’s curb appeal means absolutely everything. 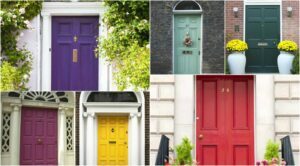 That’s why, when it comes to quick and affordable upgrades with major impact, there’s nothing easier and more revenue generating if you are selling than a new front door making your property look cared for and loved – and consider using a bright paint on the outside and a nice warm wax inside. Perfect!